We hope everyone has a safe and happy New Years! We are celebrating a few hours early with a present to ourselves…. Don’t you wish stuff came with the batteries already charged? 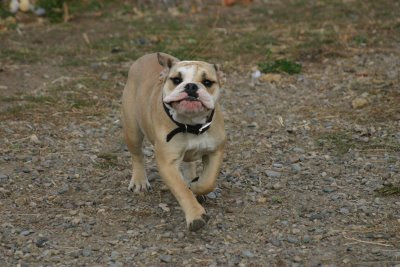 For a breed you don’t see very often, it has been nice to have a few different bulldogs at the daycare. The first to come was Ruby. The regular dogs didn’t quite know what to make of her – she looked different and snuffled a lot. However, she quickly convinced them that she could be a whole lot of fun and was always ready for some play. Then along came Bella. By now, the regulars knew that bulldogs were fun and they accepted her from the moment she arrived. I haven’t met too many bulldogs but from these two I can tell, this is a very appropriately named breed – they are like bulls in a china shop! Maggie Mae is a pure bred lab but we swear there must be some border collie in there somewhere! She loves to stalk. She will lay in wait for Gus to come up to her and then launch at the last minute. In these pictures, she was stalking a dog just behind Amanda so we were able to get some pictures of the look of concentration! From all of us at Paws on the Run – Merry Christmas! We hope you are all having a wonderful day today. We have the pleasure to be hanging out with some great company – your pets! Thanks to everyone who brought us and the dogs so much stuff – cards and gifts and yummy things to eat. I’m thankful I’ve been doing so many dog walks lately so I can burn off all those extra chocolate calories! It has been almost a week since our last blog! Sorry about that. Life has been crazy busy and blogging unfortunately is not at the top of the priority list. I think things have settled down though so posts should start becoming more regular again. Amanda put this together the other day for all of our amusement. It is staring: Kaleb, Perkins, Mira, Maggie Mae and Coulee. Enjoy! You’ve requested it, and we’ve listened. Starting the second weekend in January, we are going to open the daycare on Saturdays for 2 hours (from 11 a.m. – 1 p.m.) so that you and your dogs can come and play…well the dogs can play and you can chat with other owners. The cost will be $5 per family (up to 3 dogs). I’ve listed all the rules of the indoor dog park below. We want to make sure this is a safe and fun environment for all. You will be asked to sign a copy of these rules before entering the playroom with your dog. The rules are in place to create a SAFE, fun, healthy environment for all dogs! Upon your first visit to the indoor dog park, please have a copy of your dogs shot records that we may keep on file. Shots must include Rabies, DHLPP and Bordatella (Kennel Cough). Paws on the Run reserves the right to excuse any dog, at any time. Toys are not permitted in the play area. Please do not bring your dog if it is exhibiting any of the following behaviours: coughing, excessive sneezing, runny nose or runny eyes, vomiting, diarrhea, or unusually lethargic behaviour. If a staff member notices any of these symptoms, the dog will be excused immediately. Owners must stay with their dogs in the playroom the entire time the dog is here. Children 8 years and under are not allowed in the off-leash dog area; children ages 9 to 15 years must be accompanied by an adult. It is your responsibility to clean up after your dog. We will provide mops, buckets, poop-scoopers, etc. All dogs must have collars, For the safety of your dog(s) and other park visitors, choke, prong (pinch), collars with chain and spike collars are strictly prohibited. All dogs must enter and exit the facility on a leash. Food and drinks in glass containers are prohibited; training treats are allowed. Owners/custodians of a dog are responsible for the acts and conduct of their animal at all times when it at the indoor dog park. Dog park users and dog owners assume all risks related to use of the dog parks. Handler is limited to a maximum of three dogs. If entering or leaving the playroom, do not enter the double-gated holding area if there is already someone in that area. This will eliminate the possibility of both gates being open at the same time. Owners must quiet dogs that bark, howl, or whine excessively. Does Edie look familiar? That is because she used to be called Neena and was with the Prairie Dog Canine Rescue. We are really happy that we get to see her still as her mom has started bringing her to daycare. She has found a great home and seems truly happy. One thing hasn’t changed though…Amanda is still obsessed with her ears. She really wants them to stand up and it looks like only one of them is going to. This week has been very busy at the daycare. Which is great – it gives the dogs lots of different playmates. It seems like each day, new friendships form. D.O.G. and Kierra met for the first time today and they had a blast! Let’s hope next week brings just as many playmates! We are also planning on starting up some indoor play sessions where you and your dog can come and play. We are thinking of having these on Saturday’s from 11-1. More details to come! I’m really sorry I have been such a bad blogger. We have been having lots of technical difficulties. First the camera and then the computer. It works fine until we try and edit a picture or upload one to the internet – then the whole system crashes. It has been very frustrating. We think it might because of all our pictures… So we are going through them all and deleting all the “not so good ones” and putting all the decent ones onto CDs. This is taking us a long time because we’ve been so busy! That is a very good thing! I’ll be e-mailing everyone who got their dog’s photos taken but I thought you might also like to have a look at all the dog’s Santa Photos. You can see them all on our Flickr site.